Lake Boga is situated within the traditional country of the Wamba Wamba people, specifically the ‘Gourmjanuk’ (meaning along the edge of trees) clan. They lived around the lakes in the area and the land up to the Murray River. Lake Boga has a rich and important social and cultural history. The Wamba Wamba people are tied to the landscape where people lived and worked, and the site of the former Moravian mission. Descendants continue to maintain a strong ongoing connection with this area. The story of the Wamba Wamba people and Lake Boga are important at a community level as well as for our understanding of the Aboriginal history and prehistory of Victoria. This case study illustrates the application of the Victoria’s Framework of Historical Themes to a complex cultural and historical landscape, by drawing on seven storylines associated with the formation of the Lake Boga landscape, the former Mission, the emergence of pastoral and agricultural development and Lake Boga Township. This case study also shows a continuity of connection with Lake Boga for the Wamba Wamba people and how the themes can be used to draw out their many layered stories as well as their linkages with European settlement and the development of a rural township. Lake Boga is in the Murray River Basin of north-west Victoria and is part of the series of lakes that form the Kerang wetlands. Lake Boga and the adjacent Lake Mannaor are typical of lakes in the area, having been formed as shallow depressions with crescent shaped lunettes (sandy ridges) around the leeward (eastern) side formed during dry climatic episodes over the last 10,000 years. The area has mineral deposits that are unique to the area, with granite outcrops and tobernite (a secondary form of uranium) and is well known for its gypsum deposits. Prior to European land clearance, the native vegetation consisted of black box, chenopod woodland and an understorey of saltbush species, nitre goosefoot and tangled lignum. The lake itself supported ground-covering rushes and sedges with grasses on higher ground. Fauna at Lake Boga includes native water rats, echidnas, possums and kangaroos as well as a range of reptiles, amphibians and birds, including emus. The Wamba Wamba people have a strong connection to Lake Boga. They and their ancestors have successfully occupied the area for many thousands of years, with evidence of their activities seen in the numerous campsites and middens containing food remains of bone and fresh water shellfish, earth ovens used to cook meals, surface scatters of stone artefacts and artefact manufacturing debris, as well as the places they selected to bury their dead. The Wamba Wamba occupied a wide area that took in many of the lakes and swamps within the Kerang Lakes system, including Lake Boga and nearby Lake Mannaor as well as land up to the banks of the Little Murray River (Barne Mille) and the Murray River. The first recorded encounter between Wamba Wamba people and Europeans occurred when explorer Major Mitchell and his party passed through the area in 1836. This encounter resulted in a violent incident when one of Mitchell’s men shot and killed a Wamba Wamba man after being threatened with spears. European settlement in the 1840s had an even more devastating impact when pastoralists arrived to take up squatting runs for grazing. The pressure on Wamba Wamba populations increased in the 1850s as their land, resources and cultural traditions were threatened with the introduction of pastoral settlement and an increase in the number of travellers passing through the area. This included those heading to the Victorian gold fields, drovers and other travellers from South Australia and the Murray Darling area who followed Major Mitchell’s track to the Murray and Lake Boga in search of fresh water. The Colonial government faced conflict between the needs of the displaced and rapidly declining Aboriginal populations across Victoria and their interest in establishing a successful pastoral occupation. Government Superintendent Charles La Trobe called on the German based Moravian church to establish a mission station to save the surviving Aboriginal population, and Lake Boga was selected for the first Moravian mission in Victoria in 1851. Subsequent Moravian missions were also established at Ebenezer on the Wimmera River and at Ramahyuck near Sale in Gippsland. An outcome of the Moravian mission model was to offer Aboriginal people religious training to ‘enable them to adapt’ to the colonial lifestyle. At Lake Boga, the Moravians established their mission in 1851 on the south-eastern shores of the lake, where they planned to attract the local Wamba Wamba populations to take up permanent residence. They also hoped to establish gardens, keep livestock and open a school. However, after being unable to attract many local Aboriginal people, and with difficulties experienced with local authorities and landholders, the mission closed in 1856, leaving behind little physical evidence of its former existence. Evidence of the early European settlers and those who travelled through the area can still be seen in the fragments of glass, ceramic and metal which are scattered over a wide area within the boundaries of the former mission reserve. By the 1870s, land selectors had moved into the Lake Boga area, selecting land around the lake, along the Little Murray River, Fish Point and around the present day township of Lake Boga itself. By 1889, the Lake Boga Irrigation Company was formed to supply water to the newly establishing agricultural settlement. This involved the construction of channel networks for reticulated flow, and later the installation of a pumping station, with pumps installed at Lake Boga and Tresco by the state Rivers and Water Supply Commission in 1904. The town of Lake Boga started to develop during the late 19th century. Major developments included construction of a railway station on the line passing through the town, expansion of services to supply the rural settlement include shops and a school, as well as a secure water supply. Around this time the town was being promoted as a place to settle because of its permanent fresh water supply and the availability of small-scale irrigated agricultural allotments. By the mid-20th century Lake Boga had become an important strategic location for the allied defence forces during World War II when the No. 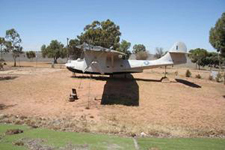 1 Flying Boat (Catalina) Repair and Service Depot and underground communications bunker were constructed to service Catalina flying planes, after the Japanese had decimated part of the Australian fleet in a bombing raid on Broome in the far north-west of the country. Following both the First and the Second World Wars, soldier settlement schemes were set up in many parts of Victoria, including at Lake Boga. This increase in population further boosted the size of the town and its services, and also led to smaller agricultural allotments around the township. Despite experiencing devastating displacement during the period of colonial settlement, the Wamba Wamba people have maintained a strong presence in the Lake Boga area from the mid-19th century through to the present. A number of Wamba Wamba people who had occupied the mission followed the missionaries to the newly established Ebenezer Mission in the Wimmera. However, many returned later to their traditional land, either taking up rural land selections or working on pastoral or agricultural properties, delivering mail, working as shearers or working within the township itself. Despite the dramatic lifestyle changes they experienced, many continued to hunt and fish traditional food sources to support their families. Until the early 20th Century, many Wamba Wamba people lived on the eastern side of Lake Boga and would walk around the lake dunes to shop in town and to attend school. However, a settlement was established on the western side of the township, and shortly after many moved into the bigger nearby rural settlement of Swan Hill. There are many places with which the Wamba Wamba people have close associations in and around the town, such as the primary school, and the cemetery where many were buried, including a number of people who had lived in the area before the arrival of the squatters, missionaries and selectors. Today, Wamba Wamba people have an interest in managing cultural heritage in the Lake Boga area. They consider the lake and surrounding landscape to be an important place because of their long connection to the land and resources.